I saw an article on-line today that was discussing whether the increase in the number of smoke alarms was responsible for the decline in deaths from household fires during the last quarter century. 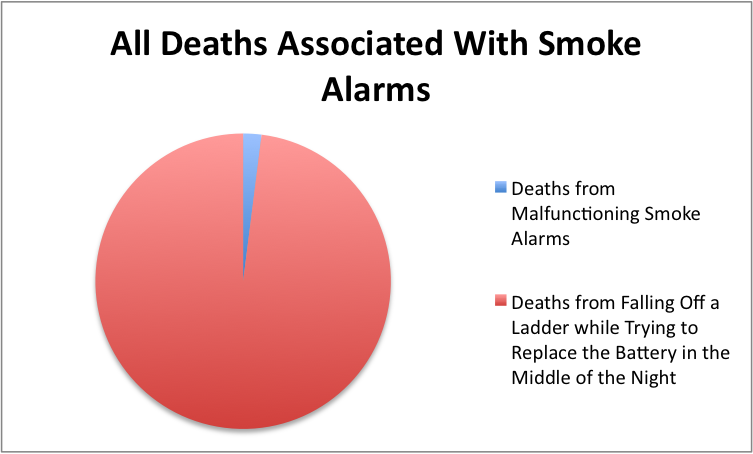 Along with the article was one of those parody infographics that I love so well (flash something with an information related graphic anywhere within a thousand miles of an engineer and watch their heads pop up in response, like meercats sniffing the wind), with a pie chart showing 1% of the time the smoke alarm notifies you of a fire. The other 99% of the time the smoke alarm is there to alert you that you’ve been cooking. We rarely experience cooking related notifications, possibly because we have newer smoke detectors. Or possibly because I’m not allowed to fry anything, ostensibly for health reasons, though I suspect that this is probably more due to Mary attempting to minimize the number of Mike related accidents per annum. So far our smoke detectors have never warned us of a fire (which means they’re 100% effective, since we haven’t had a fire in the house) but have been very, very good at notifying us when their batteries need to be changed. And this will occur, only at night, most commonly at three in the morning, for maximum effect. We seem to have something like 15 smoke detectors, as well as two carbon monoxide monitors, an emergency hand-cranked weather radio, two temperature sensors for outside, and a special NASA designed asteroid impact warning klaxon. Ok, I made the last one up, but if NASA developed one, I’m pretty sure Mary would buy it. She likes to be prepared for every possible disaster. Though when I suggest that, if we’re going to cover all the bases, we need an assault rifle with an attached chain-saw for possible zombie outbreaks, she just starts backing away, slowly. There should be a segment for dogs driven insane by the beeping too. 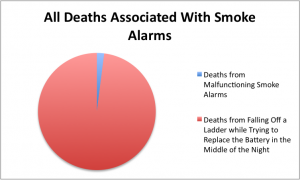 I wonder if anyone has looked to see if the decline in deaths from fires is partially or completely offset from deaths associated with trying to change the battery in the smoke detector? I should see if I can get a grant from the National Academy of Sciences.